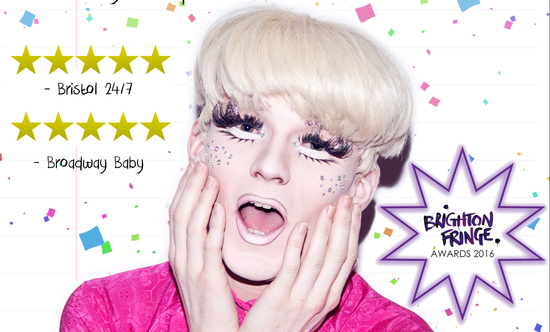 The UK’s premier Drag Prince and last years top Brighton Fringe act Alfie Ordinary comes to Hollywood Fringe with his Award Winning solo show, ‘Help! I Think I Might Be Fabulous’. With confetti cannons, puppets and sequins, this “Side-splittingly funny, extraordinary and of course, fabulous” British show sees Alfie, the son of a drag queen, discussing his time at Madame LeCoq’s Preparatory School For Fabulous Boys and specifically his friendship with with Jon, a younger closeted ‘muggleborn’ fabulous boy. Through live music and puppetry, Alfie helps Jon, challenges the norm, questions what it really means to be a man, and encourages Jon to be himself with the help of Whitney Houston and Bette Midler. “A cleverly handled commentary on society’s obsession with masculinity,” the show explores pride and shame through the eyes of a boy that has never been burdened by the pressures of modern masculinity. With songs from Shirley Bassey, The Village People, Tiffany and The Sugababes the show has a wide appeal, and it’s no wonder the show received 5 star reviews and the top Award at last years Brighton Fringe Award Ceremony. So what’s it all about? Come to Asylum’s International House and discover what it truly means to be fabulous.